The curtain is up and I-235 in Oklahoma City is now open following the first bridge move of its kind in state history by the Oklahoma Department of Transportation. 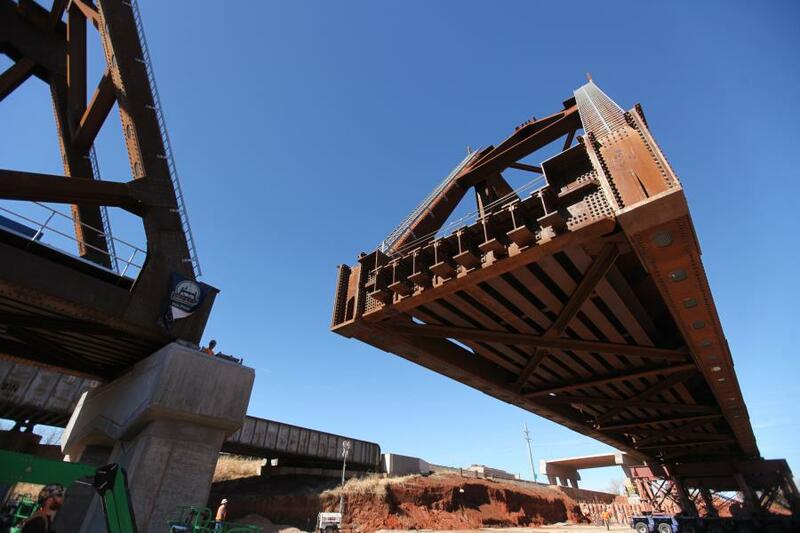 The interstate was closed for nearly 60 hours to move two giant bridge spans into place and now the new BNSF railroad bridge is taking center stage in its new home above the interstate. This historic bridge move began Jan. 26, as all lanes of I-235 were closed between N. 36th Street and I-44 to prepare for the big show. On the morning of Jan. 27, self-propelled mobile transporters began inching the first of two 45-ft. tall truss bridge spans weighing a total of 4-million lbs. from their assembly site in the work zone to their final location about a quarter of a mile to the south, just south of N. 50th Street The second span began moving mid-morning on Jan. 28 and was fully installed by early evening. Northbound I-235 reopened to traffic that night and southbound lanes opened early Jan. 29, in time for the morning commute. “We know this closure placed a tremendous burden on traffic in the area, and we can't thank drivers enough for their patience,” said Casey Shell, ODOT chief engineer. “The amazing teamwork between the project designers, Allen Contracting and American Bridge and ODOT workers to get all this in place over a weekend was truly a modern engineering marvel and something Oklahomans will long remember. 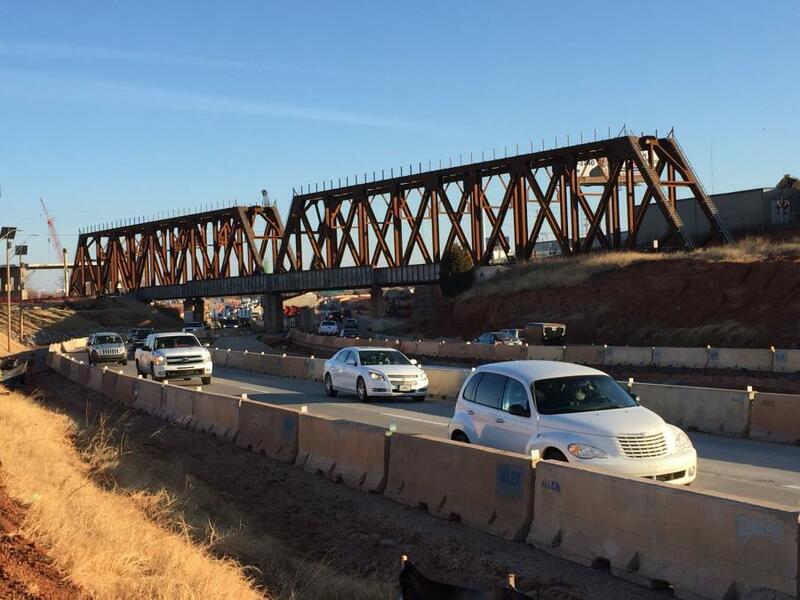 This marks the first time this type of bridge movement and installation has taken place in Oklahoma. Building the bridge truss structures near the highway and moving the fully assembled spans into place over the weekend greatly reduced the impact to traffic, requiring the interstate to be closed for a few days rather than several months if traditional bridge construction methods had been used. This work is part of the nearly $88 million reconstruction and widening project on I-235 between N. 36th Street and I-44. While completion of this bridge move is a major accomplishment to celebrate, there is still a year left in this more than two-year-long project on I-235. Motorists can expect I-235 to be open with two lanes in each direction with reduced speed limits in the work zone through 2019. Drivers are encouraged to continue using their Off Broadway alternate routes such as I-35, I-44, SH-74/Lake Hefner Parkway and I-40. Once complete, I-235 will be widened to six lanes plus auxiliary lanes and receive ramp improvements and a significantly improved drainage system for the highway. This project is one of several phases to completely reconfigure the I-235/I-44/ U.S.-77 (Broadway Ext.) interchange in Oklahoma City. In the coming weeks BNSF crews will begin laying track to connect the existing railroad line to the new structure, allowing for later removal of the old railroad bridge by ODOT's contractor. For more information, visit odot.org.